This new track from Missouri+Brooklyn’s White Rabbits pounded its way out into the world a few weeks ago, and it is a flipping fantastic song. From their sophomore album produced by Spoon’s Britt Daniel, it is all chaotic and visceral, all laughing and yelling and drums that shake my insides. And these are the best kind of drums, the primal and unrelenting ones that make me want to run off into the jungle with Brendan Fraser, and not the drum-circle kind that makes you want to punt a hacky sack at a hippie. You feel the minimalistic space and echo in this song and throughout their sophomore album, with all the best things I love about Spoon leaching into Britt’s production here. I saw White Rabbits at Monolith in 2007, and at the time I wrote that “the band had a disproportionately high number of short guys wearing dapper suits in it, and I thought that it was fronted by Fred Savage at first, which was awesome. This song boasts a ferocious thrumming piano line that I miss each time it stops.” There’s the same ragged edge and ferocity on this release as well that latches onto me. After enlisting tourmate, friend and songwriter Britt Daniel (Spoon) as producer, the pair began the process of exchanging demos between Brooklyn and Portland. The sessions were recorded over four weeks by visionary engineer Nicholas Vernhes (Animal Collective, Deerhunter) at Rare Book Room in Brooklyn, NY. Taking special care to recreate the unhinged nature of the original demos, the band utilized the wide range of tools in the analog-friendly studio to shape the personal spirit infused in the new tracks. Upon the completion of tracking, White Rabbits traveled to Austin, TX to mix the record with studio wizard Mike McCarthy (Spoon, Trail Of Dead)…. It’s Frightening is out May 19th on TBD Records (the U.S. label home of Radiohead, and Other Lives, who I just saw Friday night with the jaw-dropping Elvis Perkins). You can stream the full album on their MySpace page. Tagged with spoon, white rabbits. Thanks for covering these guys. I love this song. Very impressive blog! Thanks for the Radiohead action. I get to see them before you! Nyah nyah nyah nyahhh nyahhhhhh! love this song! 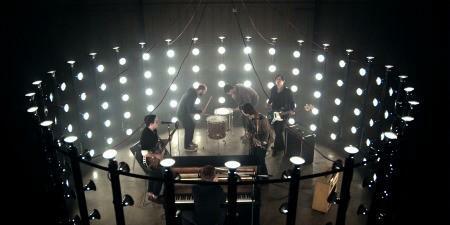 and so stoked on anything britt daniel has a part in. thanks for sharing this. 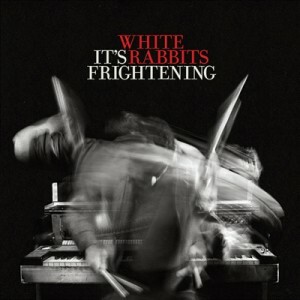 saw that cover thought it said Frightened Rabbit! !